서해안 배연신굿과 대동굿은 마을의 평안과 풍어를 기원하는 굿으로 황해도 해주와 옹진, 연평도 지방의 마을에서 해마다 행해진다. 배연신굿은 배를 가지고 있는 배주인이 배의 안전과 고기를 많이 잡고 집안의 번창을 기원하는 굿이다. 바다에 배를 띄우고 그 위에서 굿을 한다는 점이 특이하고 놀이적인 요소가 많으며 아기자기하다. 굿은 신청울림, 당산맞이, 부정풀이, 초부정 초감흥, 영정물림, 소당제석, 먼산장군거리, 대감놀이, 영산할아밤·할맘, 쑹거주는 굿, 다리발용신굿, 강변굿으로 진행된다. 대동굿은 음력 정월이나 2·3월에 주로 하며 무당이 하는 굿 중에서 가장 규모가 큰 굿으로, 마을 사람들 모두의 이익을 빌고 단결을 다지는 마을의 축제이다. 대동굿은 산에서 소원을 비는 굿을 하고, 마을의 각 가정에서는 세경굿을 한 후 바닷가를 돌며 강변용신굿을 하기 때문에 마을전체가 굿 공간이 된다. 굿은 신청울림, 상산맞이, 세경굿, 부정굿, 감흥굿, 초영정물림, 복잔내림, 제석굿, 성주굿, 소대감놀이, 말명굿, 사냥굿, 성수거리, 타살굿, 군웅굿, 먼산장군거리, 대감놀이굿, 뱃기내림, 조상굿, 서낭목신굿, 영산할아밤·할맘, 뱅인영감굿, 벌대동굿, 강변용신굿으로 진행된다. 서해안 배연신굿과 대동굿은 화려하고 규모가 큰 굿으로 신비스러움과 연희적 요소가 잘 조화되어 있으며, 소용되는 소도구 또한 상당히 많다. 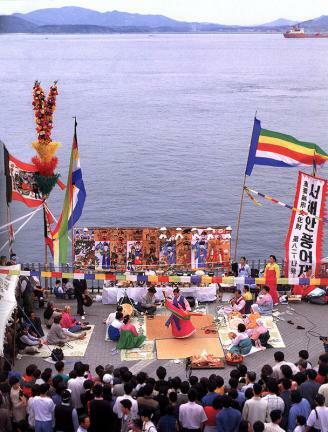 These rituals are held annually in coastal villages in Haeju and Ongjin, Hwanghae-do and Yeonpyeongdo Island to pray for the peace of the village and for a bountiful catch. Baeyeonsingut is held by boat owners to pray for the safety of the boat, a bountiful catch, and the happiness of the family. 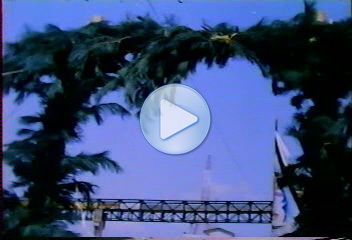 It is performed on the boat and creates a merrymaking atmosphere. Daedonggut is one of the largest-scale rituals. It is held on a suitable day in January through March on the lunar calendar to pray for the happiness of all villagers and strengthen ties among them. 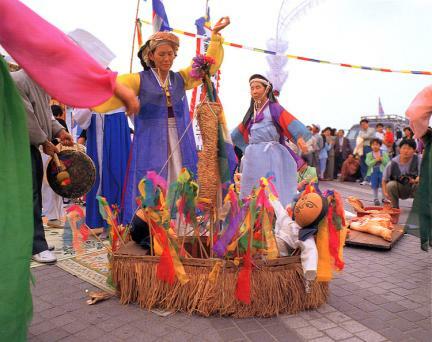 Representatives of the village hold a rite on a nearby mountain, while each household holds Segyeonggut (Rite to Farming Deity). Then, all villagers march along the coast, praying for the safety of fishermen, a bountiful catch, and peace for the spirits of those drowned while catching fish. These two rituals are held on a large scale. They are characterized by flamboyance, mysteriousness, and merrymaking, and require lots of props.